Death of the 5-Year Real Yield! Stick a fork in it. She's done! 0.0%! We hit bottom. Congrats to all of you that made this possible: Bush, Greenspan, Bernanke, Paulson, Snow, China, India, and Iraq. We couldn't have done it without you! Next up, the 10-Year? Or are we all still convinced that this downturn is a mere temporary speed bump on our way to even more prosperity? The 5-Year TIPS is currently yielding a whoppingly low 0.17%. If the markets can squeeze that last 0.17% out of them I'll be able to finish up part of my series on the Death of Real Yields. Hurray! It offers more questions than answers though. How will Bernanke and company be able to determine inflation expectations from TIPS yields once they hit zero (since zero is the absolute floor)? Will TIPS still be "wildly overvalued" (as some would argue) once they hit zero? Will people invest in non-inflation adjusted treasuries instead or a falling inflation adjusted stock market on the thought that they too can drop to zero (before stagflation drains them of every last penny)? These questions and many others will be answered on next week's episode of Soap. I was thinking of using Happy Days (another show from the 1970s) instead, but just didn't have that much sarcasm in me today! The bidding frenzy has sent TIPS prices soaring. The bonds have become wildly overvalued and now offer a terrible long-term bet. Don't blame the TIPS. Blame the inflation! What isn't wildly overvalued at this point? Perhaps you'd rather stuff the dollars under your mattress as more is flung from the helicopters? Would you rather buy gold at nearly four times what it cost just a few years ago? Imagine what is left for investors in a regular bond or balanced mutual fund that puts money in TIPS. Most do. And they charge fees of 1% a year or more. Don't blame the TIPS. Blame the excessive fees! I can't help people who wish to pay 1% fees or more on an investment only expected to earn ~4%. Further, it is an investment you can buy from the government for free. That's certainly absurd. And right now, those real yields are terrible. They recently touched record lows. Record lows? He's kidding me, right? TIPS have only existed during this era of tame inflation (introduced in 1997). Too bad he can't go back in time (or apparently even imagine it) and see how TIPS would have done in the 1970s. If inflation truly picks up as he describes in the following example, I'd not be predicting higher real yields. Contrary to popular opinion it seems, we're not going to all be making out like bandits if inflation continues to rise. No sir, the only bandits will be the government as they dilute the value of our savings. Is this really rocket science? An illustration: Imagine inflation rises to 5%. Your 10-year TIPS, with its 1.56% "real" yield, will therefore pay 6.56%. Don't blame the TIPS. Blame the inflation! Further, if TIPS really do start paying 6.56% on a regular basis AND he expects to be making more money elsewhere (presumably through even higher real interest rates as he implies) we'll be watching the housing bust turn into a housing apocalypse. As a general rule of thumb, TIPS are usually worth looking at only when the real yield on the 10-year rises well above 2%. He means as a general rule of thumb since 1997, since TIPS didn't even exist before then. Here's a thought. As a general rule of thumb, real interest rates were decidedly negative during nearly the ENTIRE 1970s. Good luck holding out for this mythical 2% real interest rates in this environment. Get out the disco balls! As a long-term investment for serious individuals, TIPS right now look absurd. Absurd? Really? I'm certainly dead serious. I'm not going to pump my money into the stock market instead if he's right about where inflation is headed. We'll see how well the stock market will do if TIPS start paying 6.56% or more on a regular basis as he suggests. We'll see how well the consumer can hold up as inflation continues to rise. We'll also see how well the real estate market will do as mortgage rates rise to compensate for that inflation. Woohoo! It will be quite the party. Leverage baby! Buckle up and hold on! This is not investment advice. I could be wrong of course. I just find it all very amusing that he can say TIPS are absurd. It is the INFLATION that is absurd. Maybe he's got some sort of magical device that protects himself from it though. I'd really like to know. If we truly are entering a serious bear market (with the rising inflation he uses in his anti-TIPS example), the goal is to lose less than the next person. That's the best we can hope to do. What we don't want to do is flop naked around on the beach once the tide goes out though, or back up the truck into the soft sand. That's my thinking anyway. The article is silly. If you really want to scare me out of TIPS, tell me the economy is going to be incredibly strong soon and we'll be seeing huge increases in the number of productivity miracles. Now THAT could scare me out of TIPS. Using higher inflation as the reason to avoid inflation protection is silly though. Very silly. Damn our economy must be in bad shape to use such silly scare tactics. Just my opinion of course. 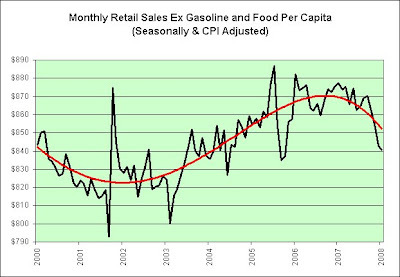 The above chart shows retail sales per capita adjusted for inflation. It excludes food and beverage stores, food service and drinking places, and gasoline station sales in order to strip out the ever popular "food and energy" that is all the rage these days. The trend line is a 4th order polynomial. Needless to say, I'm not all that impressed with the supposed resiliency of our economy (nor am I impressed with the supposedly strong January retail sales numbers once adjusted for inflation). 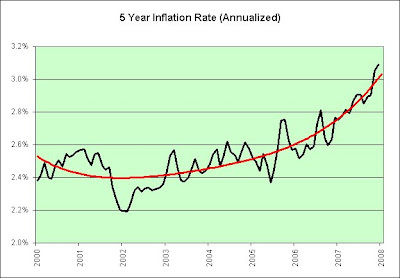 The above chart shows the annual inflation rate as determined by using the previous five years worth of inflation data. I keep hearing on the TV that we should stay the course and keep the long-term perspective. Well, there's the long-term perspective. If we stay the course we'll be using digital wheelbarrows to buy bread someday (i.e., charged $100k to buy a loaf of bread + interest of course). Is it just me or is that starting to look a bit parabolic? Oh oh. I've been stagflationary for over 3 1/2 years so far. My biggest mistake, using hindsight, is that I was too optimistic. Yeah, you heard me. Using hindsight, this food and basic necessities hoarder has been too optimistic! Had I been even more bearish I'd still own gold and silver (owned from 2004 to 2006). That being said, I suspect I'll be stagflationary for MANY more years to come. I'm not in the short and shallow economic troubles camp. Unfortunately, the investments that work best during stagflation continue to work well. Too well. I bought more TIPS yesterday. I had a three month treasury bill mature last week and pushed much of it into my TIP fund. I no longer own any three month treasury bills. I put the rest of it in a new ING Direct savings account (paying better interest and FDIC insured). I'm almost entirely in TIPS and I-Bonds these days though. I'm growing more confident that the long-term stagflationary case is a solid one. Hey, I wonder if all those people who were so giddy over our home prices appreciating are as giddy over what is going on to the assets in our pantries? I recently bought 24 jars of Prego on sale (four 26 ounce jars for $5) at Albertsons. I'm confident that I made at least a 10% nominal return on that investment so far. How cool is that? The reason I'm confident is that my local Costco was out of Prego until yesterday. When it was restocked it came with a much higher price tag. Go figure. You won't see me jumping up and down with joy over it though. I don't see how having 24 jars of Prego at a higher price actually helps me any. It will taste EXACTLY the same and I'll be eating the profits (I LOVE spaghetti :)). Oh well. Hey, at least I don't have to pay property taxes (next year's property taxes are going up 9% for me, *sigh*) on my Prego hoard nor will I need to pay capital gains on it. Woohoo! *gallows humor sarcasm* I have a similar 10% story as it relates to Pace Picante. The battle between the red sauces and being in the red (borrowing our prosperity) continues on. The former appears to be gaining serious traction though. Or is that losing traction? As in well-anchored inflation expectations eventually breaking loose of their moorings? Once again, this is not investment advice. I'm merely stating what I believe and what I have done to potentially protect myself somewhat. I could be wrong on both counts (especially if stagflation becomes hyperinflation and/or I'm missing some part of the big picture). I suppose I should also be happy that my recent clothing/sheet hoarding moves were well rewarded by our government's monetary printing press activity. Apparel prices up 0.4% in January? That must be driving the deflationists insane. For all intents and purposes Christmas was a bust, right? Just imagine what clothing prices would have done had Christmas been a smashing success. Once again, I'll be paying no property taxes and/or capital gains on my t-shirt "collection" (sounds more elegant than "hoard" I suppose). I'll no doubt be wearing them to the point of worthlessness someday (especially with a shoulder riding parrot who likes to make holes), lol. I hope you find these charts useful. I don't make nearly as many as I once did obviously, but still intend to do some from time to time. There just isn't as much point these days. Most of my charts point to long-term problems. What's a month's worth of data really going to do to change them? Sorry to be the bearer of bad news. Oh how I am sorry. The following link is sure worth a read, especially if you live in California and/or think the 36+ million people who live there might affect our overall economy.